"We need to pause and consider just how smart cells ... really are. "Headphone cords tangle, DNA strands don't. Here's why. One cell can hold a gigabyte of data; plant and animal tissues have a billion cells per cubic centimeter. One juicy bite of steak (5 cubic centimeters) contains over 1018 bytes of data, an exabyte -- more than all the videos downloaded on the entire internet in a single day. 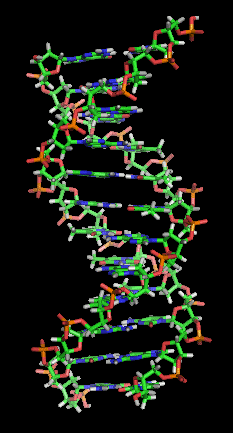 "If you stretched a strand of human DNA end to end, it would be 6 feet (1.8 meters) long. But it is folded into a space so small that it is literally a trillion times denser than any hard drive. Plus the cell easily reads it whenever necessary. How is this possible? "The folding of DNA inside the nucleus of the cell is fractal. A unique mathematical pattern places folds within folds within folds so that, unlike your headphone cord, DNA strands don't tangle. "Unused DNA is kept in a high-density area, using the folding pat­tern within a pattern. This storage pattern is called a fractal globule. It enables the cell to store DNA in amazingly little space, avoiding tangles and knots that would destroy the cell's capacity to read its own instruc­tions. The DNA quickly unpacks and repacks during gene activation and cell replication. "'Nature's devised a stunningly elegant solution to storing infor­mation-a super-dense, knot-free structure,' says senior author Eric Lander, director of the Broad Institute, who is also professor of biol­ogy at MIT and professor of systems biology at Harvard Medical School. "The globule is a lattice, a pattern known to mathematicians, in which every point is only visited once and no paths intersect. This prevents knots from forming. "The Harvard Gazette reports, 'The human genome is organized into two separate compartments, keeping active genes separate and accessible while sequestering unused DNA in a denser storage com­partment ... the information density in the nucleus is trillions of times higher than on a computer chip.' Cells move chromosomes back and forth between the two compartments as needed."